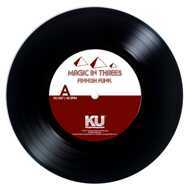 Magic in Threes release their second release on KingUnderground with a double sided funk 45 inspired by 70s soundtracks. The band Magic in Threes, consisting of 3 members are from Nashville, Tennessee. On Friday 9th February 2018 we are releasing two songs of theirs that sound like they could be on an old KPM library record or a 1970's soundtrack. The band have a full length in the making coming out on KingUndeground in the near future. In 2016, the band were writing and recording a new track every week. They spent so much time in the studio that year that the song ideas just kept coming, one after another. They have always been rooted in library music and over the years they've dug deeper and deeper into that sphere of inspiration. "Finnish Funk" and "Shot Thru The Grease" are both loving homages to that genre. Heavy beats with diabolical melodies are the name of the game for The A-side, "Finnish Funk". On the flip side "Shot Thru The Grease" has more of a loping feel to it with ample portions of moody thematic elements. Like a score to a lost 1970s Italian action film, these tracks hit like a hard nosed detective closing in on his next collar.